Hon. Kwame Governs Agbodza, Member of Parliament (MP) for Adaklu and a ranking member on the committee on roads and transport has express worry and disappointment in vehicular drivers over the recent road carnages on the Kitampo -Techiman and Cape Coast -Takoradi roads. The two gory accident took the lives of a total of about (71)passengers with some survivors who sustained various degrees of injury and still battling for the lives at the Government Health facilities nearby. "Some of the victims, numbering about 35 according to the reports, we're burnt beyond recognition and had been buried in a mass grave at Jema" the Hon. disclosed. Hon. Agbodza speaking on the floor of Parliament yesterday indicated that the two gory accidents are clarion calls for critical and frank re-examination of our road safety management methods and measure to resolve the avoidable injuries and deaths on our roads. 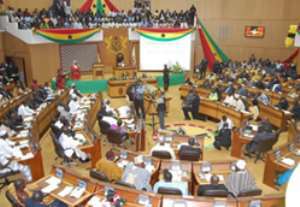 "Mr Speaker, on Friday 22nd March 2019, two buses, a Grandbird with registration number GT 3916-17, which was also travelling from Accra to Bolgatanga collided head-on at the town called Ampoma, a farming settlement along the highway between Tuobodom in the Techiman North District and Jema. The Lawmaker expressed dismay in his statement by indicating that, Mr. Speaker, just as when many Ghanaians were yet to come to terms with this sad incident, on Saturday, another gory vehicular accident occurred on the Cape Coast -Takoradi road, claiming seven lives and others admitted in nearby Health facilities for treatment of serious injuries. Hon. Agbodza, said" Mr Speaker, I must say that the level of canapé and the number of victims on our roads is getting to a crisis level; statistics from the Motor Traffic and Transport Department (MTTD) of the Ghana Police Sevice on the spate of road accidents for this first quarter of this year, 2019, indicates an upsurge in fatalities; a cause for concern as human lives are irreplaceable. "According to the MTTD, a total of 411 persons were killed and 2,048 were injured through road traffic crashes on Ghana from January to end of February 2019". Mr. Speaker, although, official investigations into the accident are yet to be concluded and reports public, some unconfirmed accounts attribute the possible causes of both accidents to overspeeding, use of lane of the oncoming vehicle in the opposite direction, indiscipline and some other causes that are yet to be ascertained by our road traffic regulatory and enforcement agencies. "I urge the National Road Safety Commission, b the main regulator, to adopt this system among others to monitor commercial vehicles that travel distances check whether the vehicles actually stop at rest stops, check whether drivers on long distances actually change after the prescribed hours of driving, and speed limits, among others. "In the petroleum downstream sector, the National Petroleum Authority has a Bulk Road Vehicle Tracking system that tracks the movement of fuel tankers across the country from a central location". "While the system checks fuel diversions, it offers a solution to commercial vehicles across the nation if properly adopted". Mr. Speaker, in times of these accidents, the socio-economic impacts are often felt beyond the accident victims and sometimes incomprehensible; the education, livelihoods and other socio-economic supports, of the dependents of the accidents' victims often come a naught abruptly.